This Web-Site is dedicated to the development under the EU project Smart-Its (2001-2003). For newer development visit the Particle-Computer area. You are interested in Smart-Its technology and want to be kept informed? Click here! To submit comments and/or subscribe to our NEWS mailing-list. July 2003: Exhibition at SIGGRAPH 2003 in San Diego. The Smart-Its project is interested in a far-reaching vision of computation embedded in the world. In this vision, mundane everyday artefacts become augmented as soft media, able to enter into dynamic digital relationships. In our project, we approach this vision with development of "Smart-Its" - small-scale embedded devices that can be attached to everyday objects to augment them with sensing, perception, computation, and communication. We think of these "Smart-Its" as enabling technology for building and testing ubiquitous computing scenarios, and we will use them to study emerging functionality and collective context-awareness of information artefacts. 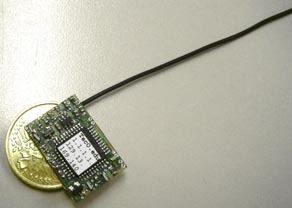 TecO has produced about 160 sensor and about 140 sensor boards (most of them are handed out to research partners). The current release including all information about hardware, software and status can be found in the release section.